DATES: Subject to numbers and flight availability, the Friends plan for the Mission to depart Australia on Thursday 14 November 2019 and to leave Israel for the return journey Motzei Shabbat 23 November 2019. 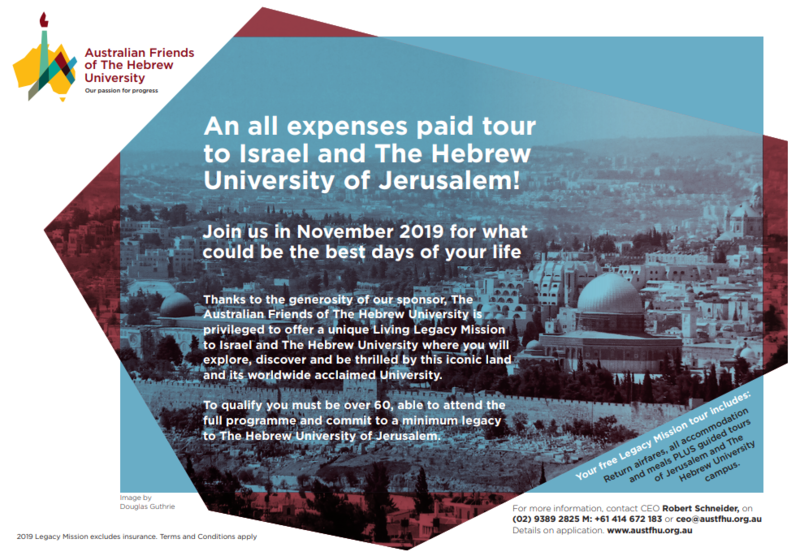 A minimum bequest of not less than $50,000 to the Hebrew University (in the case of a couple a different arrangement may apply) is mandatory and proof that such a bequest has been included in the participant’s will needs to be furnished to the Friends by the participant’s solicitor. A participant has to agree to participate in the whole program. The travel dates, flights and program may be changed – including the cancellation of the whole Mission – in the sole discretion of the Friends. A participant needs to furnish proof that they have purchased travel insurance at least three weeks prior to the Mission departing Australia. If a participant decides not to participate within three weeks of the Mission departing, or if anything untoward happens during the Mission necessitating the participant to have to withdraw from the Mission, the participant will have to reimburse the Friends for any expenses incurred by the Friends e.g. air tickets, hotel accommodation etc. for a representative/s of the Friends to interview applicants. by a participant and any additional information it may require from a participant. The Friends reserves the right to decline any booking. No booking shall be deemed accepted until confirmed in writing by the Friends. For further inquiries please contact our office at austfhu@austfhu.org.au, 02 9389 2825. Alternatively, please leave us your contact details and we will get back to you in due course.